The entire team at Honest-1 wants to thank you for attending our January event. 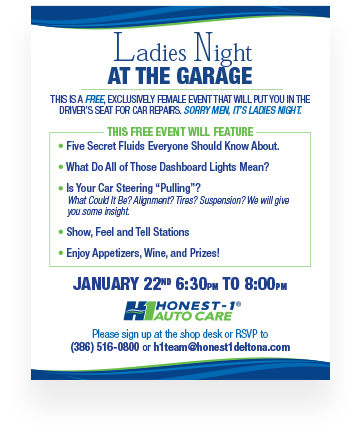 We really enjoy putting on these classes and are always thrilled by the participation and the desire for women to learn more about their cars. We truly believe you will make better car care decisions with more knowledge about your vehicle. We hope we gave you a few nuggets of information to use. Thank you for attending. By the way, our next event will be on May 21st. Please save that date and attend.